Kelly has no knitting projects on the needles and she has finished her first Papel Picado in filet crochet. It still needs to be washed and blocked, but it turned out great! There will be at least a few more of these finished before Halloween this year. 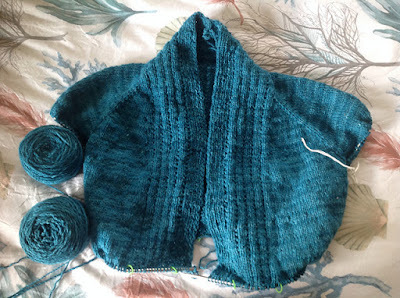 Marsha had a set back with her cardigan Iba by Bonne Marie Burns. The skeins of yarn looked the same but when she started the sleeves she realized there was a difference. The hard lesson learned is this is what happens when you are so impatient to start knitting that you don't alternate skeins. Remember, no one ever regretted alternating skeins. Marsha unravelled the entire sweater and has started over, making good progress. The Monterey Fair and Wool Auction was a complete success and Kelly ended up with some nice fleeces. Six of them, in fact! Besides fleece and fair food, there was the most interesting chicken at the fair this year!